I write fiction and creative non-fiction for the same reasons I write scientific papers: to describe the world around me, to make some sense of it, and to share what I find with others. I also love making beautiful things. Because I feel strongly about the conservation crisis—and because there isn't enough being written about it—most of my essays and short stories are based on things I've seen or done in conservation. I've written two novels about tropical forests. 100 Species (2018) is about a couple of American biologists who are collecting plants and beetles on a road-building project in the Amazon when the 9/11 attacks occur. Over the years I've run into a few other collectors who were in the field on the day of the attacks. Lars was up in the headwaters of the Piedras putting in tree plots and didn't learn what had happened until he came downriver to the city a week later to resupply. The Orejuelas were mist-netting birds in the Llanganates and heard the news by accident when they phoned Gabriela’s mother to wish her a happy birthday. An entomologist I know had planned on being at the station in El Refugio that month, but at the last minute she’d gotten some grant money to visit beetle collections in the United States. On the morning the planes hit she was peering through a dissecting scope in the insect rooms of a big natural history museum in Chicago. Somehow she never heard the news, or the order to evacuate. By the time she left it was early evening and the museum was deserted. Outside police lights were flashing on the white marble steps of the museum and F-16's were buzzing the lakefront. “What’s happening?” she asked a policewoman. The cop just stared at her. Youth (1993) is about a conflict between a Costa Rican park and a campesino who lives in the park. Out on the porch of the field station the wind was fresh and wet. I carried the knife and backpack into the workshop and switched the light on. The workers had been there and the floor was muddy and all the machetes were gone from the rack. There was a message for me on the chalkboard. I turned on the little radio and dance music came in through the static of the storm and enlivened the workshop. I put away my things, changed into a dry shirt and sat down to look at the damp map I had drawn. I dried the paper with a towel and traced over the pencil marks so that they stood out clearly. When it was done I took a sandwich from the backpack and ate it listening to the music. Next door, in the office, Juan Carlos had switched on the two-way radio. Static drifted through the slats in the wall. I opened one of the field guides and read through a difficult genus. After half an hour the workers still hadn't come in. I took the book out on the porch and opened the door to the office. A voice was coming over the two-way radio indistinctly. I paused to listen. "Shut the door," said Juan Carlos. The signal rose and suddenly we were listening to the emergency signal of a fishing boat off course in the Pacific. Behind the tired voices I thought I could hear the sound of waves. "Have you ever been in a boat on the ocean?" asked Juan Carlos. "It's horrible," he said, pulling at his muffler. "Isn't it horrible? The water tastes like fish. It gets in your mouth." I stood looking at the empty spaces of the map. The signal had fallen into obscurity again and through the radio noise a voice said something that was lost in the storm. Juan Carlos swung around from the desk. "God save their souls," he said. Suddenly the room was quiet. He looked up soberly from the letter he was writing and out the window, where the wind was advancing through the trees. "I think she can read," he muttered. "In any case, she'll have no problem finding someone to read it to her." Neither novel has been published. For now, try the essays and short stories. 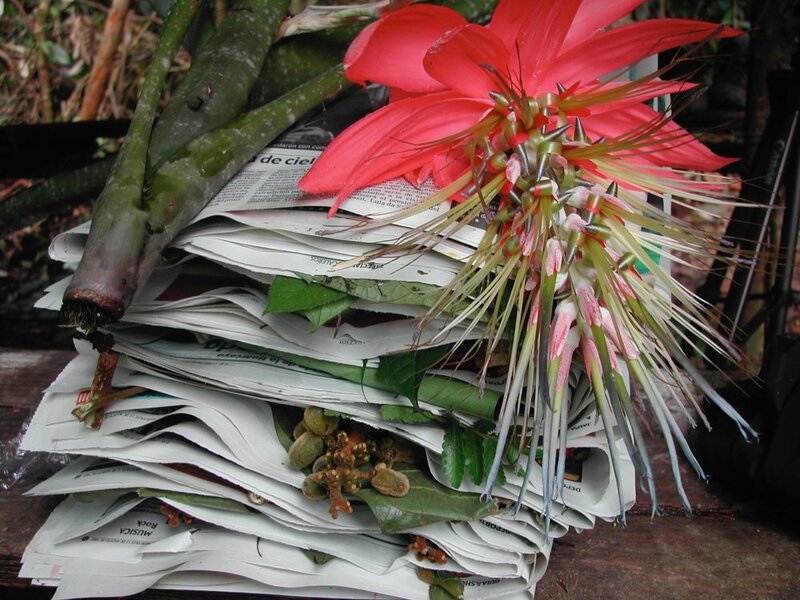 Photo by me, of plant specimens collected on a 2002 rapid inventory of the Ampiyacu watershed, northern Peru.